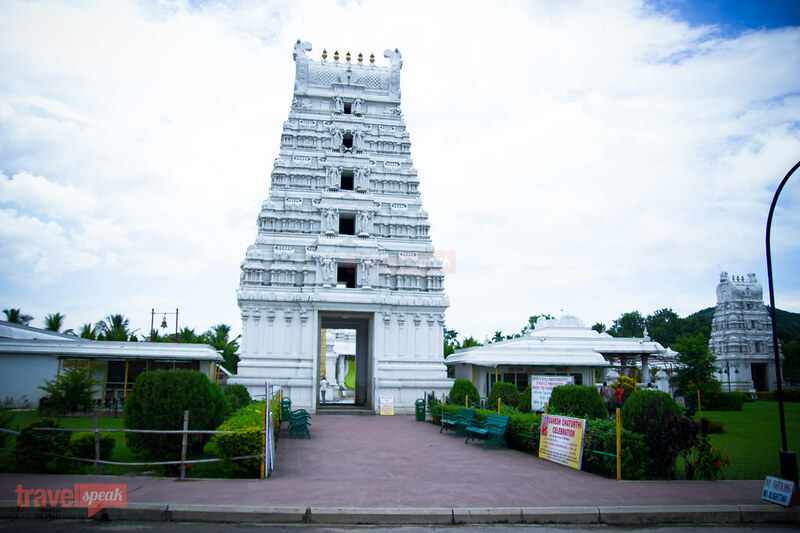 Balaji Temple is a magnificent temple located at Lokhra, Guwahati sprawling over two acres of land. 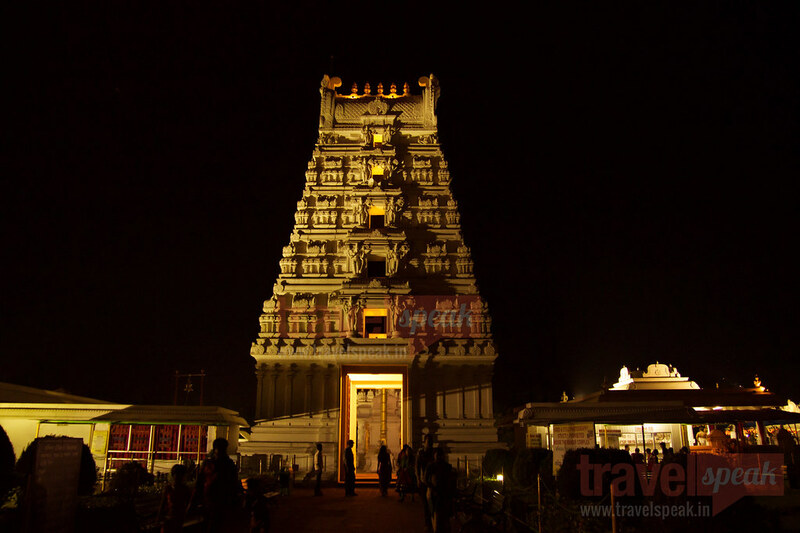 It is dedicated to Lord Venkateswara and is a holy shrine for the pilgrims from the north-east. The sanctums of Lord Ganesh, Lord Balaji and Goddess Durga can also be found there. 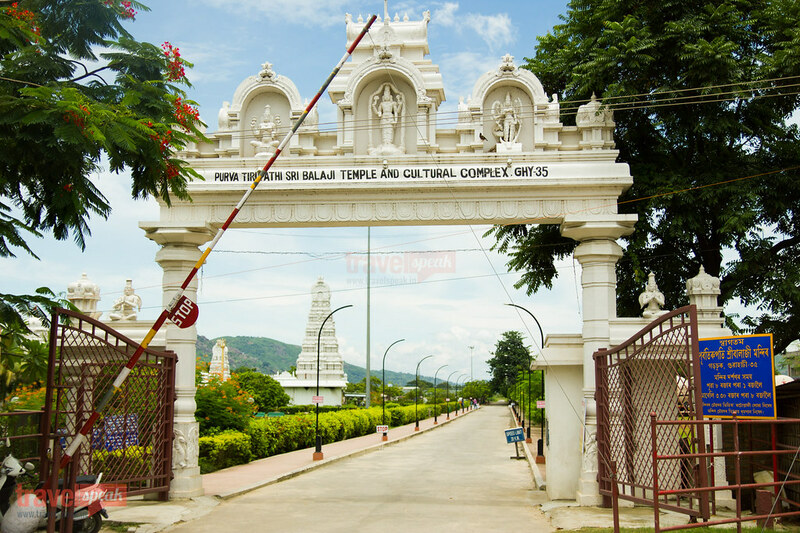 Balaji temple in Tirupati is a famous pilgrimage place for the Hindus. Thousands of devotees visit the place throughout the year. But Northeast being in a remote corner of the country all is not fortunate enough to visit Tirumala. 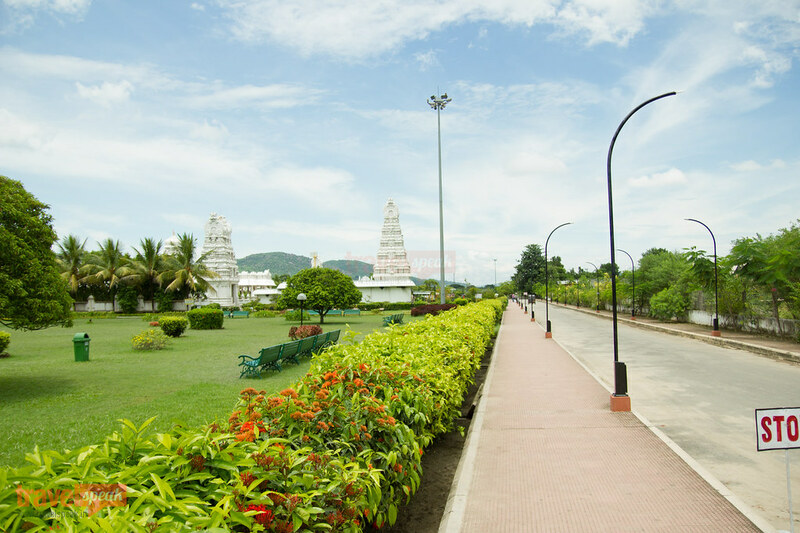 So, the Balaji temple in Guwahati caters to the need of not only the people of Northeast region but also of the entire east, spreading the divine message of Lord Krishna. 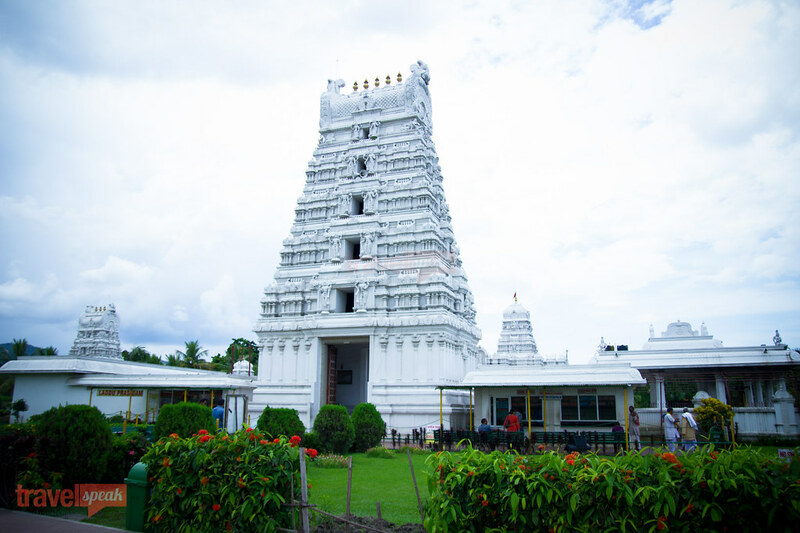 The architecture of this temple is very unique in the region as it follows the pattern of the South Indian temples. The temple complex of the Purva Tirupati Sri Balaji has a clean environment and aura. The entrance to the Complex is decorated in ancient style graced with a temple of Ganesha, the acclaimed remover of obstacles. The main temple is dedicated to Lord Balaji and seated there is an idol of the deity carved out of a single stone weighing 4 tonnes. The features, smiling face, ornaments are crafted on the stone with Sankha (conch) Chakra and Four arms (one Abhya Hastam showering blessings, and the other on the hip) all add to the solemnity and serenity of the Temple. The Utsava Murthy comprises of Lord Balaji and his consort, Ubhayee. Nachiars and Chakrathalwar are carved out of metal. In between the main entrance and the Temple is the Dhwajastambham (Flag pole), which is 60 ft. in height and is made of a single Sal tree covered by copper plate with brass coating. It was installed within a month’s time from the Kumbhabhishekham, as per the tradition. 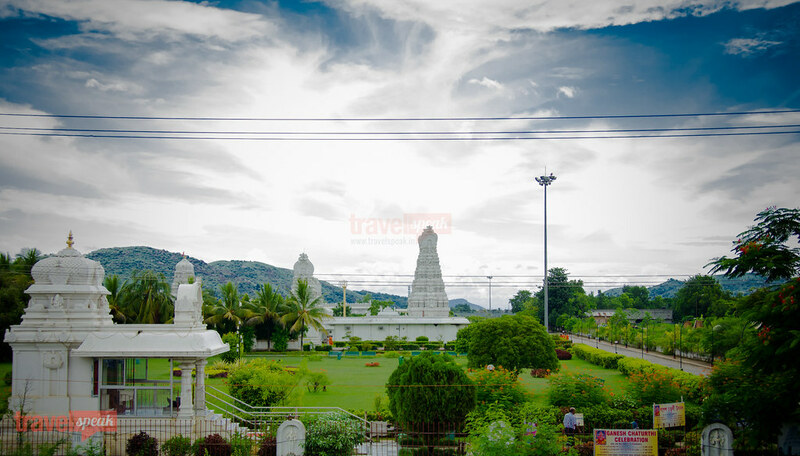 Adjacent to the main temple of Venketshwara, there are temples dedicated to Goddess Padmavathi (Avatar of Mahalakshmi) and Garuda, the Vahana of Lord Balaji. The Temple of Lord Balaji holds a rajagopuram, a maha mandapam, an ardha mandapam, and the sanctum. 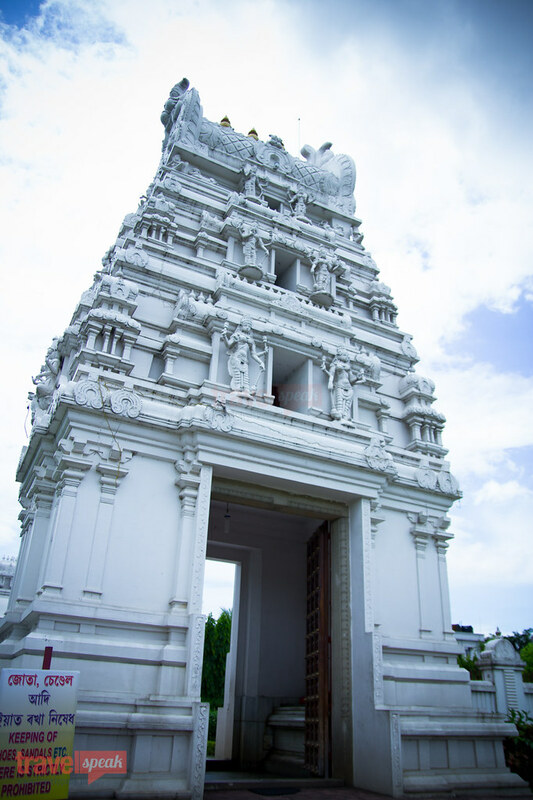 The gopurams(gate) are constructed in South Indian architectural style, its height ranging from 8 feet in the Ganesh Temple to 70 feet in the Rajagopuram. They are painted in pristine white and glints when sunlight falls on them. On the directive of His Holiness Sri Sankaracharyya of Kanchi Kamakoti Peetam, a temple has been built for Goddess Durga as Guwahati happens to be the seat of Goddess Kamakhya. She has 8 arms, bearing the Sankha, Chakra, gada,knives, bows and arrows. The bow is made of stone which, when tapped makes a metallic sound. A Yangasala has been built in the traditional style to enable devotees to perform Yagnas of their choice. The exquisite wooden doors have been handcrafted in Chennai. 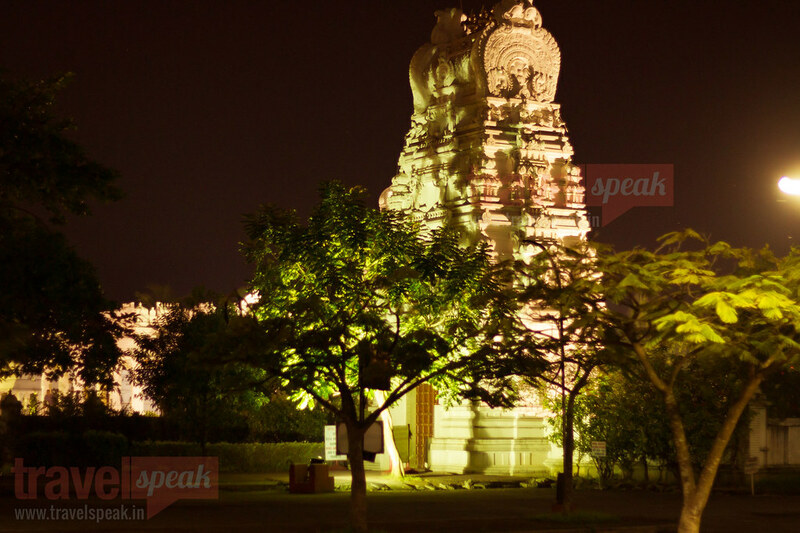 The temple is well illuminated at night and is a marvel to watch. 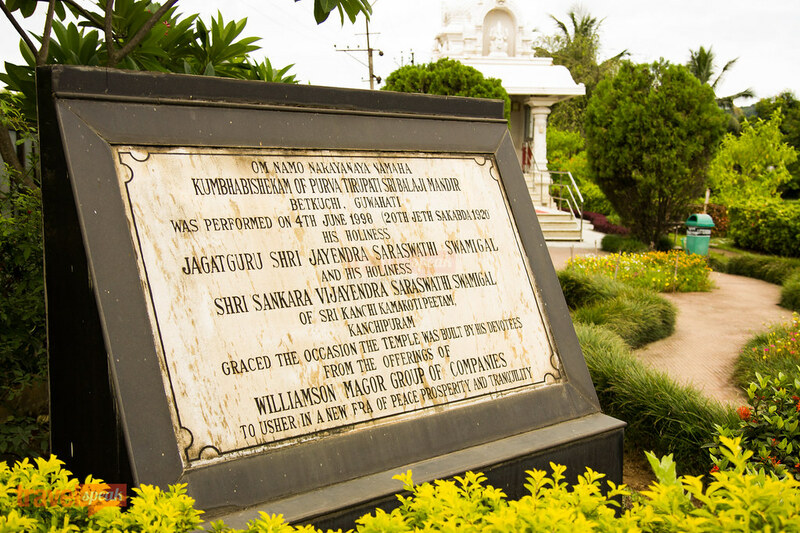 There is a park also attached to the temple. A gentle breeze drifts across the lawns surrounded by blooming coconut and Ashoka trees, flowers, plantains & bougainvilleas. Cultural functions, classical and folk music are held every Sunday at state of the art auditorium built adjacent to the temple. The Asthanamandapam is basically used for spiritual activities. 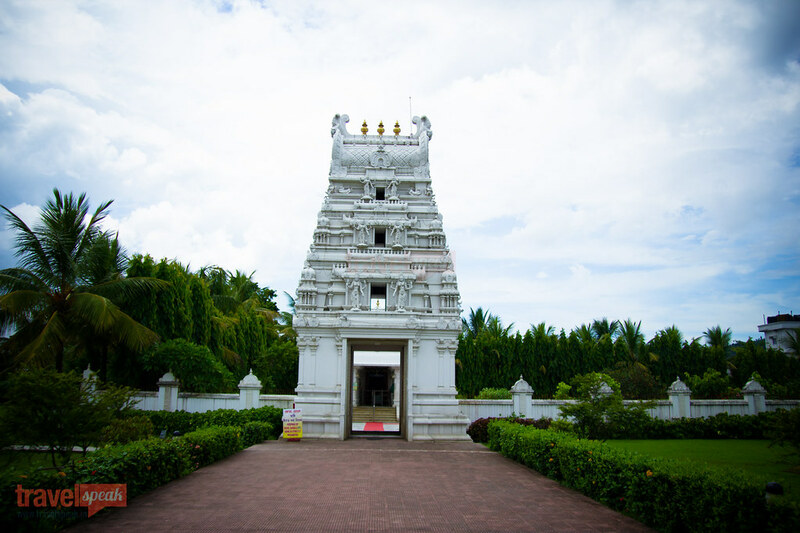 All around the Asthanamandapam hall, the Dasavathar of Lord Vishnu has been depicted and the entire structure follows the South Indian architecture, keeping symmetry with the temple complex. Pujas, Abhishekam and rituals like archanas are performed throughout the day – from Suprabhatam in the morning to Ekantaseva at night. Pujas are conducted daily, monthly or yearly in the name of devotees hailing from all parts of the country. Sahasranama Archana is performed every Saturday for Lord Venketshwara. Every Tuesday and Friday, Archana is performed for Devi Durga. Besides this, devotees can offer ‘bhog’ on any day of the week. Free Prasadam is given to devotees twice a day. The famous Laddu prepared by the experts from Tirupati is also available in the Temple as prasadam. 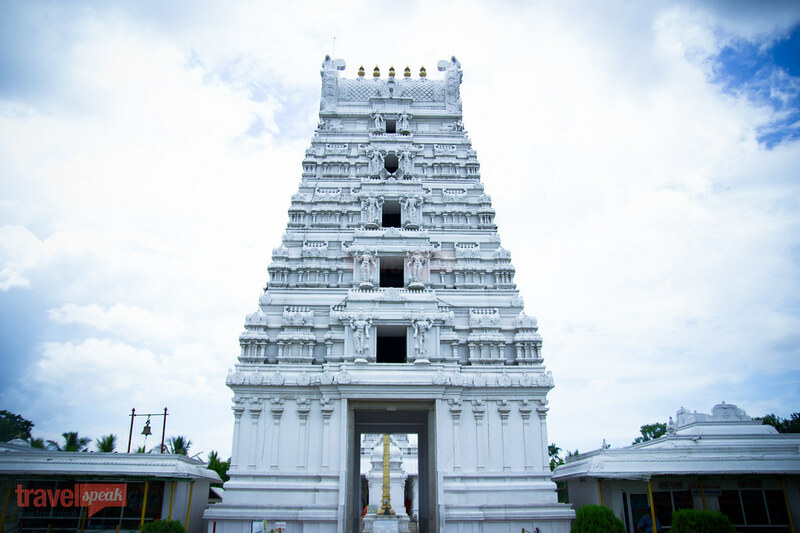 The Temple also administers a Pooja Trust Scheme for the welfare of the devotees and their families.Under this scheme, any person can donate a certain sum of money and specify a particular date and Deity (Lord Balaji, Padmavati, Durga, Ganesh) to whom the 4-Kala Poojas are to be performed. The archana takes place for early morning 7am to 11am and reopens again at 3 or 3.30 depending on the season and continues till 7.30 pm.The different pujas are Nitya Puja for Rs.12000 which is performed daily, monthly puja for Rs.7500 performed once a month, annual puja for Rs. 5000 performed once a year. On the specified date and for the specified Deity, the Temple will perform the Poojas on behalf of the donor for his entire lifetime and offer the prasadams to the donor or his representative, if present, at the temple on the particular date, or send the Vibhooti/Kumkuma Prasadams to the donor by post. The Pooja Trust donation may be paid either by cash or by Demand Draft / Cheques drawn in favour of ‘Purva Tirupathi Sri Balaji Seva Samiti’ and can be handed over or sent by post at the office of the Samiti. 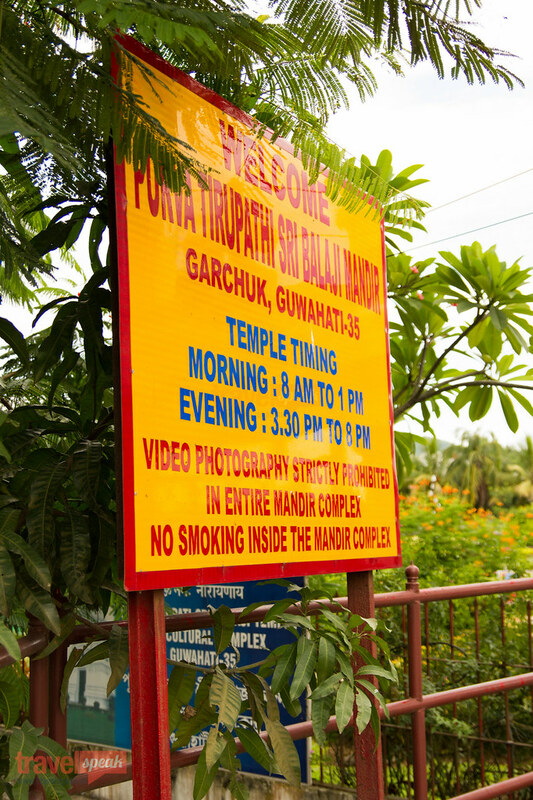 The temple is a recent addition to the list of tourist attraction in the city of Guwahati. 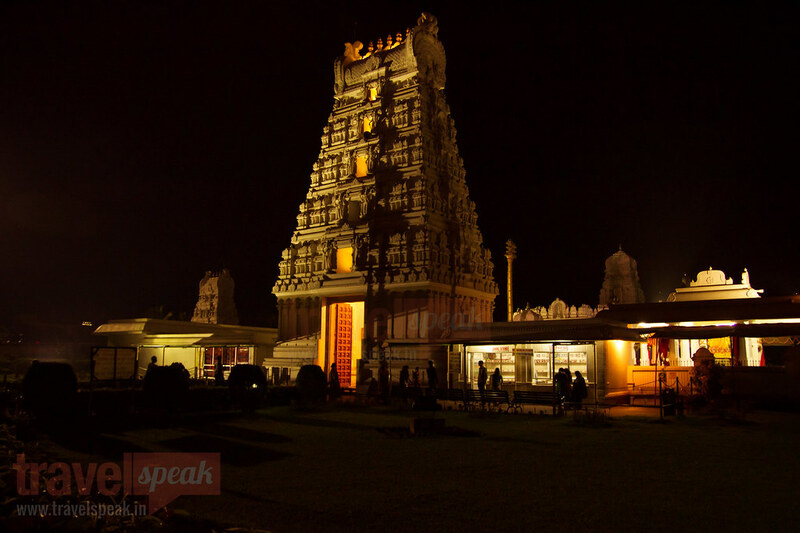 The imposing structure with the beauty of the temple is simply breathtaking. The tranquil and serene atmosphere free from pollution will satiate ones heart and bring peace of mind. 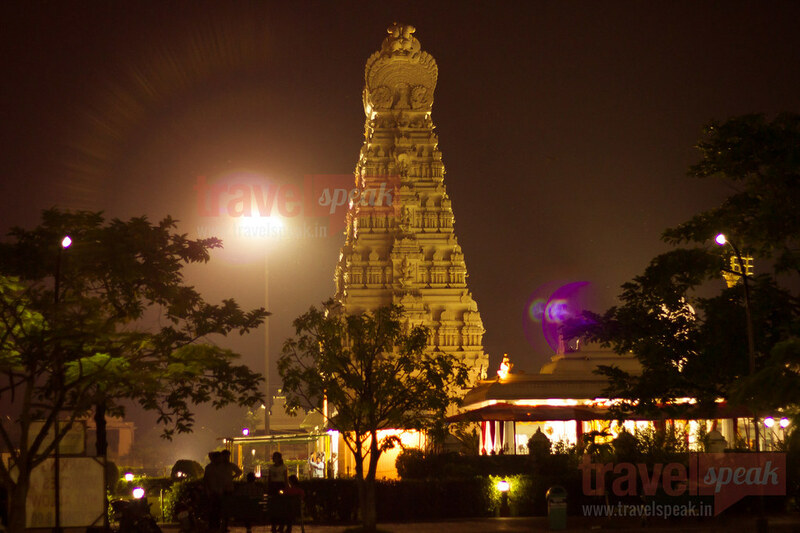 This temple can be easily reached from Airport, Railway station as there is direct bus service to the temple. Inter State Bus Terminus is close by and just a walking distance. The temple authorities also provide bus service to tourist. During the main puja and yaganas extra buses ply from different part of the city. Hotels and restaurants are not very close to the temple but in the Beltola area one can avail the best of these services.